The indexes traded in a very tight range around yesterday’s close and some will claim this shows support at this price level. But in reality there were just as many willing sellers as willing buyers, so it is a wash from a directional standpoint and it would be more accurate to declare today a draw. Where we go from here largely depends on who has a bigger war chest, the bears or the bulls. Of course the above analysis assumes we just consider buyers and sellers. But maybe we can get a little more insight if we also include short-sellers. Given yesterday was the largest index gain of the year and all sorts of professionals made the case this was a blow-off top, no doubt we had quite a few bears aggressively selling into this strengths. In this regard, the buyers at least matched the best the bears could throw at them, which is moderately bullish. And now all these new shorts are ready buyers if we move any higher and they get blow out of their positions in a short-squeeze. Often the surge that makes the head of a head-and-shoulders is a fast upside move propelled by premature bears covering their shorts. With the new short-sellers taken into consideration, the path of least resistance is probably still up for the moment. Weekly log chart showing two different trend lines. And how about that AAPL? What a monster run! Without a doubt this stock has changed its character from steady chugger to race car. No matter what time-frame you chose and how you draw your trend lines, today’s price action has broken above them. Even the slope of the 50-day moving average is the steepest it has been since the depths of the 2009 bear market bottom. Does this mean AAPL will finally get the respect it deserves and can finally shake the pathetically low 12 P/E its been hanging on to? This is one of the fastest growing, most profitable, and exciting companies in the entire world and it is trading at a valuation comparable to a boring dividend stock with no growth prospects. Or alternately is this stock surging in a climax-top and today’s gap-up is the last gasps of this run? A person could make a lot of money if they got this one right. As a non-owner, I have been pretty vocal that owners of AAPL should lock in profits back at $525 and without a doubt I was wrong on that call. Maybe I am early, but in the markets where timing is everything, early is the same thing as wrong. Daily chart showing both a longer-term trend line and a shorter-term trend line since the recent breakout. So do I continue to be wrong, or do I change sides on this trade and jump on bard this run? As a trade, I just can’t do it. This one clearly passed me by and I hope it keeps going up for all those who are still holding it, but the look of that chart just scares me. Of course AAPL is more than just a single stock story. AAPL represents more than 10% of the NASDAQ index and whichever way AAPL goes from here, it will also drag the market with it. 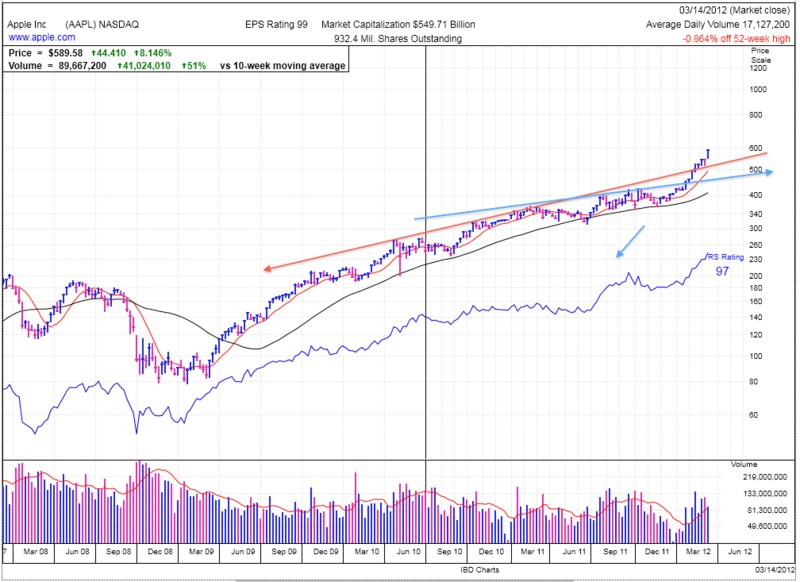 AAPL’s strength has almost single-handedly pulled the NASDAQ way ahead of the S&P500 since the beginning of the year. And no doubt this is a double edged sword as a declining AAPL would also have the same outsized effect. I wish I had a better answer for people than that. But so far I have been wrong on this name and will probably continue for a few more days or weeks while AAPL continues its surge before finding a good level to base at. But I do know that in the markets nothing goes up forever. So keep an eye on this stock and if you own it, tighten up your stops and get ready to lock in those outstanding profits. And if you end up selling too early, don’t fret, it is a fool’s game to try and top-tick the market.